Forging(Hada): Forging is very fine Itame-hada that is covered with sparkling reflection Utsuri on Hira-ji surface and darkish lines of Chikei appears on Hiraji-surface. Temper(Hamon): Hamon is super fine Ko-Nie hard metal granules base, undulating long tassels of clove Choji-midare. In the interior of temper there works with frequent long Ko-Nie feet that emit into the cutting edge. Temper of tip(Boshi): Boshi forms Midarekomi undulating irregular state, medium circles turns back like a side view of Jizou stone stature and turns back deeply. Tang(Nakago): Nakago is in UBU original. One Mekugi-ana punch. Ha-agari-Kurijiri bottom heel swelling in full. Yasurime is slanting left Katte-sagari with upper horizontal Kesho mark. Inscription in the unique style of writing Reisho, Kariya-han kaji HIROSHIGE-saku 刈谷藩鍛冶寛重作 and the other side is chiselled the date of year In the 8 th month Meiji 4th 明治四年八月日. Smith HIROSHIGE 寛重, the most distinguished pupil of Tairyu-sai MUNEHIRO 泰竜斉宗寛, had engaged in making swords with his master for a daimyo chief Doi 土井 of the Koga domain (now Koga-city, Ibaraki pref). 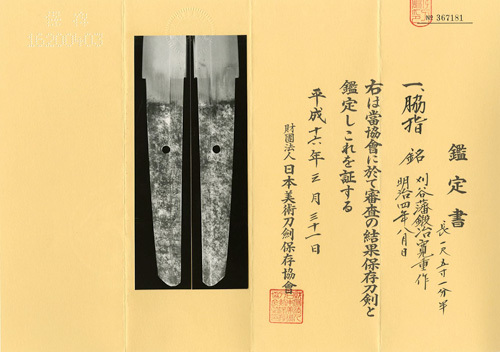 During a disturbance period of Meiji Imperial Restoration, he was appointed a sword smith with an exclusive contract under Doi family daimyo of Kariya domain (now Kariya-city, Aichi pref.) on after 11th month, Meiji 1 (1868). As soon as he went to start a new engagement, the law of HaihanChiken, the abolition of the feudal domains and establishment of prefectures, came into force on Meiji 4. Consequently he was compelled to resign himself to fate, therefore his extant work is quite rare due to only a few years activity, knows as an unprolific maker. He models long footed Choji-midare on his grand master Koyama MUNETSUGU 固山宗次 and succeeded to a professional name Issen'sai 一専斉. Also he observes workmanship of Utsuri, Boshi of Jizou style and Nakago style of filemarks/Reisho style inscription on his master Tairyu-sai MUNEHIRO 泰竜斉宗寛. This wakizashi is a superb piece of work that closely resembles one of his master and greatly impressed with his outstanding skill.